With future federal clean energy policies in doubt, proactive clean energy policy will likely be left largely to states in the next few years. Fortunately, a New York policy proposal could show the way forward on energy efficiency for utilities. 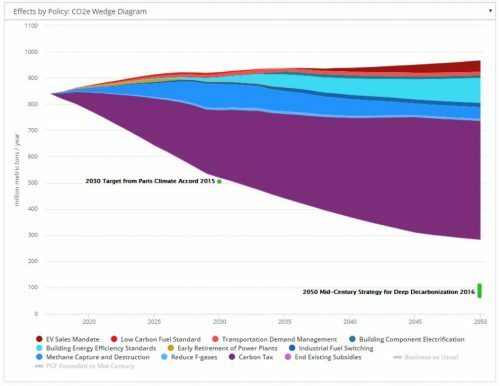 An outcome-oriented metric would focus on the policy goal of reduced energy use overall, putting a smaller emphasis on the administratively intensive business of attributing savings to specific actions. California fortified its role as a global leader in climate policy with the passage of Senate Bill (SB) 32 and Assembly Bill (AB) 197 on Sept. 8, establishing a new ceiling on emissions in 2030 under SB 32 – 40 percent below 1990 levels. While these new laws clearly demonstrate California’s unprecedented ambition to decarbonize its economy, they also raise questions about their implications for California’s cap-and-trade system. It is highly likely that California’s cap-and-trade program post-2020 will be enabled under the state’s new SB-32 and AB-197 bills, as it is a necessary part of a policy package maximizing net social benefits. However, policymakers will have to make some adjustments to cap-and-trade program design regarding, for example, new limits on out-of-state offsets and how allowances are to be allocated post-2020. California has fortified its role as a global leader in climate policy with passage of Senate Bill (SB) 32 and Assembly Bill (AB) 197. On Sept. 8, Governor Jerry Brown signed these bills into law, establishing a new ceiling on emissions in 2030 under SB 32 – 40% below 1990 levels – and new rules guiding regulators on how to accomplish emission reductions. In 2004, Colorado voters bet on the outcome of costs dropping for wind and solar energy as they were used more — and it looks like the initiative’s promise is coming to fruition. Today, around 6,000 gigawatt hours (GWh) of generation from Colorado coal plants could be replaced with 2 gigawatts of wind while reducing costs passed onto ratepayers — without threatening reliability. Market failures, political barriers, and other challenges help illustrate why many policies affect only limited segments of the economy. A broad spectrum of policies designed to overcome these market flaws can better arm policy makers with the tools they need to tackle climate change. A carbon tax would be very useful to help solve climate change, but isn’t the only solution — and indeed, it actually works quite poorly in certain parts of the economy, for three reasons: Some sectors are essentially indifferent to pricing; some consumers (including most industries) are likewise largely indifferent; and the politically realistic ceilings of a carbon tax are below meaningful effects in many economy sectors. Recent reports on California’s cap-and-trade program could mislead observers to conclude the system is “collapsing” and undergoing a “meltdown.” But hyperbole isn’t reality, and quite the contrary, the state’s climate policy is succeeding — California is just 3 percent above its 2020 goal of reducing emissions to 1990 levels as required by AB 32. Meeting California’s 2020 greenhouse gas emissions goal is turning out to be easier and cheaper than expected.